Home » board games , department of homeland security , games , government , law enforcement abuse , monsterpocalypse , privateer press , security theatre , united states , war on terror » Department of Homeland Security halts Monsterpocalypse strategy guide publication! "Radical ideas" espoused by board game a terrorist threat?! Department of Homeland Security halts Monsterpocalypse strategy guide publication! "Radical ideas" espoused by board game a terrorist threat?! Folks, please understand something: this is NOT a joke! That was my first thought when I read about this situation late last week. And then over the weekend I played Monsterpocalypse for the very first time (and very much enjoyed it) at HyperMind and this was the #1 topic of discussion among the faithful players meeting there. So then I contacted the good people at Privateer Press, the producers of Monsterpocalypse, and received confirmation: the Department of Homeland Security has delayed the publication of the Monsterpocalypse Series 3: All Your Base Strategy Guide due to "national security concerns". Throughout the day I have made attempts to contact the Department of Homeland Security, by both phone and e-mail. As of this writing no one in any official (or unofficial for that matter) capacity with the United States government has gotten back with me about why a collectible miniatures game focusing on giant monsters, aliens and robots wrecking havoc on tiny plastic cities is supposed to be a threat to national security. Bellevue WA July 21, 2009—Privateer Press reports that the release of the Monsterpocalypse Series 3: All Your Base Strategy Guide for the Monsterpocalypse collectible miniatures game will be delayed due to national security concerns. Homeland Security pulled the shipment for an intensive examination last week when it arrived in the United States. While no comment was made to the nature of the investigation, several crew members within Privateer Press believe the government became concerned over some of the more radical ideals espoused by several factions within the Monsterpocalypse game. Privateer Press Chief Creative Officer Matt Wilson said of the investigation, "Privateer Press would like to extend its complete support to the men and women who defend our national security on a daily basis. However, I am confident that the investigation's outcome will reaffirm the rights of free speech and protest of the radical environmental group Green Fury at the perceived devastation man is having on our planet as well as the freedom of people to practice religion without governmental oversight—even those religions which may very well bring forth the minions of the ancient Lords of Cthul." For more information and updates on this and other Monsterpocalypse news visit www.monsterpocalypse.com. The collectible miniatures game (CMG) Monsterpocalypse brings the giant-monster genre—a pop culture favorite—to the tabletop in the form of a fast-paced, action-packed game. Designed by Matt Wilson, the award-winning creator of WARMACHINE and HORDES, Monsterpocalypse leverages the critically acclaimed abilities of Privateer Press as a leading miniatures manufacturer to enter a new category of product with a property that appeals to a worldwide fan base of all ages. 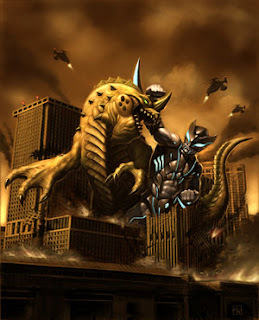 Players can visit www.monsterpocalypse.com for game previews and updates. Privateer Press, Inc. is a privately held producer of entertainment and hobby brands based in the Seattle area. Its products include the newly released Monsterpocalypse collectible miniatures game, the award-winning WARMACHINE and HORDES hobby miniatures games, the award-winning Iron Kingdoms property, Bodger Games, the full-color No Quarter Magazine, and the Formula P3 hobby line. To learn more about Privateer Press, visit www.privateerpress.com or contact the president, Sherry Yeary, at (425) 643-5900 or sherry@privateerpress.com. Incidentally, something very similar was reported a month ago happening to comic book artist/writer Mark Sable, whose new graphic novel series Unthinkable deals with possible terrorist scenarios that begin coming true. But so far as Monsterpocalypse goes: I suppose that this might well mark the very first time, ever, that the U.S. government has made an official position against giant dinosaurs, Martian invaders, and Lovecraftian horrors from beyond the realm of normal space and time. Sleep soundly, folks! Whether it be protecting us from Taliban terrorists or Green Fury activists, the Department of Homeland Security is on the job! ...does this mean that I'm now suspected by Homeland Security of colluding with "terrists" and using weapons of mass destruction?!? In a different time and a saner age, that might be pretty funny. But when tiny plastic toys are considered a legitimate enough danger to American sovereignty as to warrant spending time and money stopping the publication of a game manual, something is seriously off-kilter in this country. DHS has learned nothing from the Steve Jackson Games mess. The War On Terror is now The War On Terra Khan. God I need a drink.